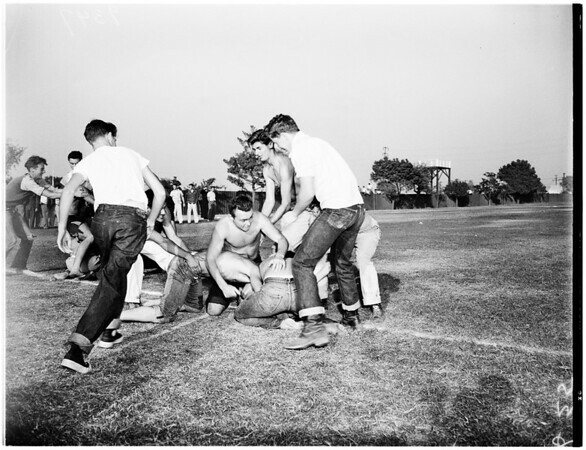 Sack Race, Tug of War, and Mud Fight at Loyola University, sophomores and freshmen,1951. Caption slip reads: "Photographer: Sandusky. Date: 1951-10-04. Assignment: Sack race, tug of war and mud fight at Loyola. D25, 26: Sack fight -- sacks full of flowers. D1, 2: Stephen Rich and Tim Ziegler (don't know if l/r or not -- no one can tell anyhow). Shots with tug of war show freshmen vs sophomore -- everyone wound up in mud puddle. Rest of shots show mud fight, sophomores defending hill & freshmen attempting to climb greased pole on hill & capture dink hat. Sophomres succeeded in defending 'heartbreak hill'".